Now with more power! And connect your smart device with Bluetooth! Enjoy your music on a more powerful speaker with no wires! This karaoke player has a sleek design matched by no other player you'll ever find. 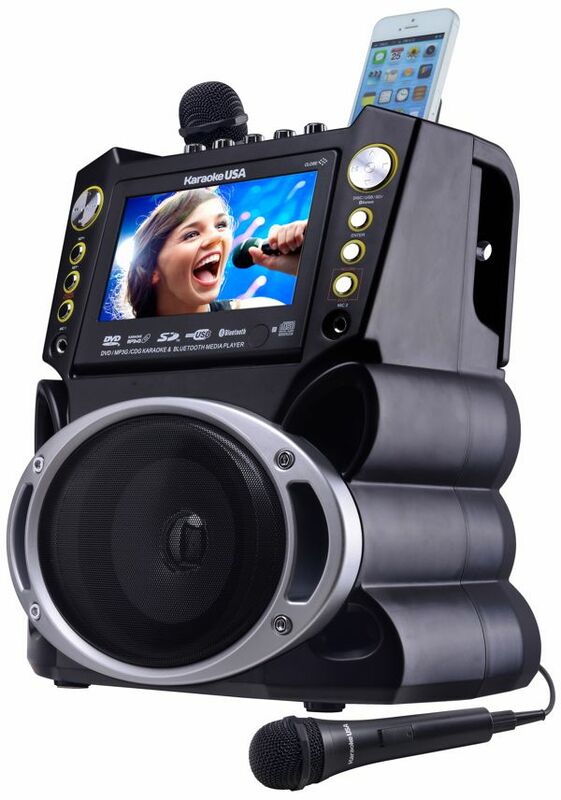 It's features will keep any karaoke enthusiast busy. A color screen that's gorgeous and easy to read far away. Comes with 300 MP3G songs on disc, but will play any normal karaoke CDG, DVD Karaoke or watch a DVD movie. Keeping in tune with the digital age, it will accept auxilary input from most any personal player and gaming console. Even has a handy cradle to rest your MP3 player in for charging or watching your screen in an upright position. Sing and record music and your voice onto an SD Card in MP3 format from your favorite karaoke disc or download, then play it back or take it with you. Audio/video outputs for connection to big screen TV, or better, your home entertainment center for great sound.